Sound is a vibration that travels through the air. The ear gathers these vibrations and directs them to the eardrum. This vibration causes the eardrum to move back and forth. Three small bones attached to the eardrum carry the vibration to the inner ear. They also help increase the loudness of the sounds. This occurs through a lever action similar to moving a large weight using a long stick and a pivot point. The three small bones are attached to the cochlea by the oval window. The cochlea is a spiral shaped tube which contains fluid. 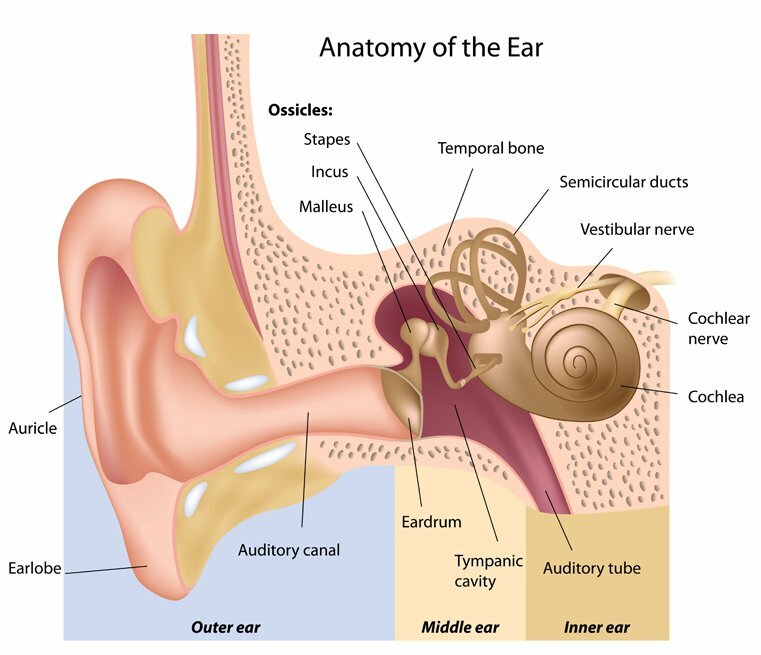 When sound enters the cochlea a wave is created in the fluid that stimulates tiny cells called hair cells. The hair cells convert the wave into an electrical impulse that travels to the brain along the auditory nerve. The area of the brain that processes sound is located in the temporal lobe. The brain decodes the electrical impulses and interprets what the sounds are.